State Dept. urges 'calm' after revealing that 17 year-old shot dead after lobbing firebombs at Israeli civilians was an American citizen. Washington confirmed Friday that the Palestinian Arab teenager who was shot dead by the IDF after he attempted to throw firebombs was a US citizen, according to AFP. "The United States expresses its deepest condolences to the family of a US citizen minor who was killed by the Israeli Defense Forces during clashes in Silwad on October 24," State Department spokeswoman Jen Psaki said. Calling for "a speedy and transparent investigation," Psaki said officials from the US consulate in Jerusalem were in touch with the family of the youth. Palestinian officials named the boy as Orwa Hammad, 17, saying he was shot while throwing firebombs - a regular occurrence near Silwad, near the Binyamin community of Ofra. 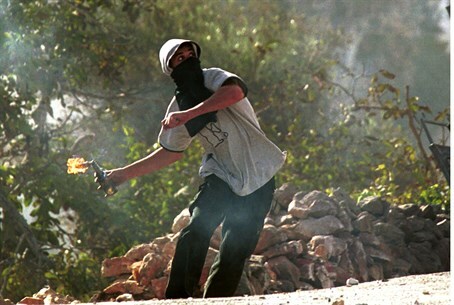 Israeli troops said he had been about to throw a petrol bomb at Israeli motorists near Ramallah. Tensions have been high since terrorist Abdelrahman Shaludeh rammed his car into a crowd of Israelis in Jerusalem on Wednesday, killing a three-month-old baby girl, Chaya Zisel Braun hy"d, who was also an American citizen, and critically wounding a seminary girl. Nine people were wounded total. "We continue to urge all parties to help restore calm and avoid escalating tensions in the wake of the tragic recent incidents in Jerusalem and the West Bank [Judea-Samaria - ed. ]," said Psaki.